A super-food kinda day over here! 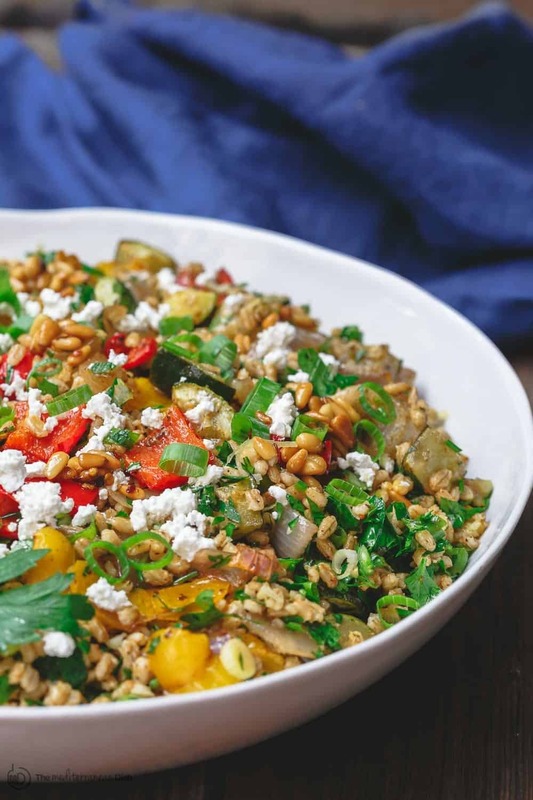 This roasted vegetable barley recipe is chockful of flavor, texture and goodness! Bonus, you can make this ahead as part of your meal-prep! Omit the feta for a vegan option. I love a versatile dish that you can serve as lunch, side, or a satisfying salad to feed a crowd! Even better, if it works for meal-prep and can be divided and stored in the fridge for later. 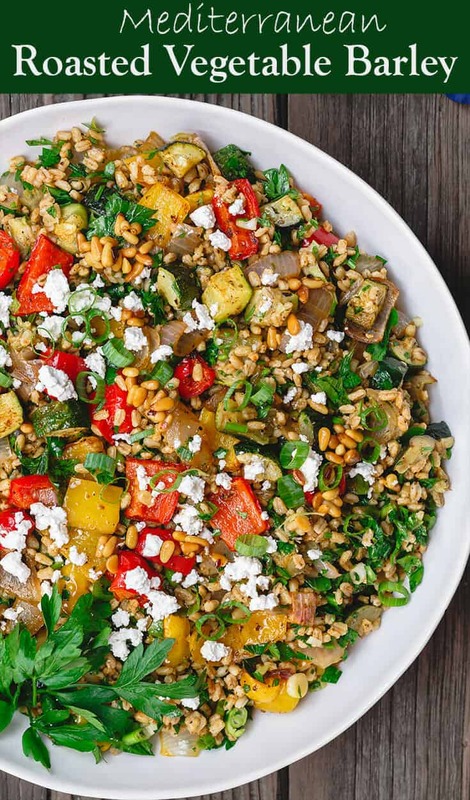 Enter this Mediterranean roasted vegetables and barley recipe! Barley is a great ancient grain that’s been used in Mediterranean cooking for many years. It’s not as popular as say quinoa, but it has a lot of great health benefits–it provides a good range of vitamins, minerals and antioxidants. And because it’s so fiber-rich, barley is a great ingredient to use if you’re looking to looking to add volume to augment a meal. 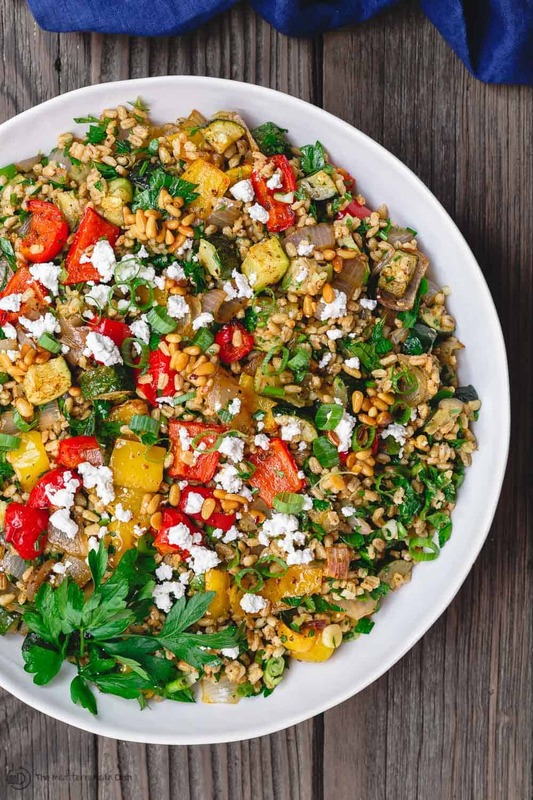 In this recipe, cooked pearl barley amps up my roasted veggies, turning them into a gloriously rich and satisfying dish by adding lots of volume and texture. My spices of choice for this recipe are all-natural harissa spice and smoked paprika. Both adding depth and playing up the sweetness of the roasted veggies and earthiness of the barley. If you’re not familiar, Harissa is a fragrant spice blend of three different kinds of chili along with sumac, caraway, fennel, cumin, coriander, garlic and peppermint. It’s very unique, really. And it does not make this recipe spicy, but it adds a welcomed kick and a sweet North African aroma. What kind of barley to use in this vegetarian barley recipe? Pearl barley is more readily available in stores. It has been polished, or “pearled” to remove some or all of the outer bran layer along with the hull; this is why it cooks faster. Technically, pearl barley is bit of a refined grain, but still healthy and very good for you. If like, add your favorite protein such as this lemon chicken or a simple pan-seared salmon or this baked salmon. I often serve this barley as the star dish next to other vegetarian items like roasted garlic hummus and falafel patties. 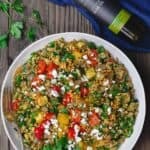 Easy roasted vegetable barley recipe, prepared Mediterranean style with fresh herbs, spices, citrus and extra virgin olive oil. While barley is cooking, place diced vegetables (zucchini, bell peppers, and red onion) on a large baking sheet. Season with salt, pepper, 1 1/2 tsp harissa spice, and 1/2 tsp smoked paprika. Drizzle with extra virgin olive oil. Toss to coat. Spread evenly in one layer on the baking sheet. Roast in heated oven for 25 minutes or so. When barley is ready, drain any excess water. Season with salt, pepper, 1/2 tsp harissa spice and 1/4 tsp smoked paprika. Toss to combine. Transfer cooked barley to a large mixing bowl. Add roasted veggies. Add chopped scallions, garlic, and fresh parsley. Dress with lemon juice and a good drizzle of Early Harvest extra virgin olive oil. Toss. If you like, top with crumbled feta and toasted pine nuts. Serve warm, at room temperature, or cold! Enjoy. Prepare ahead notes: If you don’t plan to have this barley dish the same day, it’s best if you don’t dress it with the lemon juice and olive oil until a few minutes before you are ready to serve it. Also hold off on adding the feta and pine nuts until ready. It will keep well in the fridge for 3 to 4 days in a tight lid container. Recommended for this recipe: harissa spice blend and smoked paprika from our all-natural spice collections. SAVE! Create your own 6-pack or 3-pack of spices! 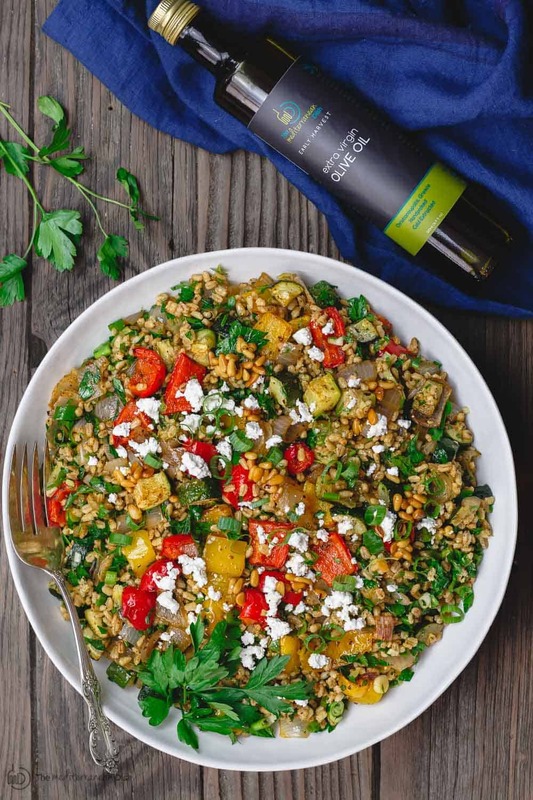 Recommended for this recipe: for best taste, highly recommend Early Harvest or Private Reserve Greek extra virgin olive oil (from organically grown and processed Koroneiki olives. What a complex and flavourful main or side dish! I had to sub sambal oelek mixed with some caraway, coriander, and sumac for the harissa, as well as a delicata squash for one of the courgettes–otherwise I made it exactly as-written. I’m weirdly fond of barley, anyway, but my husband loved this, too! I just made this and it’s wonderful! Will definitely make again and again!Thankyou for the recipe! The harissa spice blend at my local grocery store has vegetable oil in it along with the spices. Do you think I could get away with using the same amount as your recipe calls for? I can’t wait to try this recipe but I do not have harissa yet. Can I sub other spices? I am planning an order but I need to wait. I love your recipes & have made quite a few. Hey Marlene, harissa is a bit of a unique spice here. You can try other warm spices to your taste (a mixture of sumac, caraway, coriander), it won’t be exactly the same, but should work. We have quick and medium pearled barley available. Since the medium takes 45 minutes to cook it is probably the one to use. Can’t wait for summer and fresh vegetables so I can try this. Enjoy, Nancy! Thanks for stopping in. Sure, Michael. Farro would work really well here. Cooking time will vary a bit; I’d consult the farro package. Incredibly tasty – thank you so much for this flavorful recipe. Family definitely wants this one in the rotation! Jim, I am so glad to hear it! This is a new favorite over here. Made this tonight with za’atar salmon (your recipe). A very flavorful combination. I thought the harissa might make the barley too spicy, but no, it was perfect. You do have excellent taste when it comes to seasoning. Thank you! I just made this for dinner List night. Subbed Kamut for the the barley and it was delicious! Your recipes are always a hit. Thank you! Thank you so much for sharing, Kristen! Love to hear all the ideas. Question: Have you tried this with farro? It’s my new addiction. Oh, farro would be great here! Really, you can switch out the grain however you like. So fresh and easy, I love to mix up my side dishes with barley. Love the addition of barley in this roasted veggie recipe! Roasted veggies are just so warming. Love having a versatile recipe like this! Great for meal prep for lunch or dinner! I love the amazing flavors in this dish! Great combination! What a delicious looking dish! Well, all of your recipes are so tasty anyway though! I am loving all the veggies in this! Wait —-what? All my favorite tidbits in one recipe? This is wonderful, I love Barley and lord knows I love veggies to death. This is a win-win recipe for me to try. A lovely and wholesome dish. The colours are wonderful too. Perfect for any day of the week, and ideal for go to work lunch in a box.